Irma Update: Hurricane Pushes Toward Puerto Rico, With Florida In Its Sights : The Two-Way The strongest storm ever recorded in the Atlantic outside of the Caribbean and the Gulf of Mexico is moving away from Puerto Rico. More than half of its residents are without power. A Category 5 storm, Hurricane Irma's "extremely dangerous core" is moving over parts of the U.S. Virgin Islands and heading for Puerto Rico. 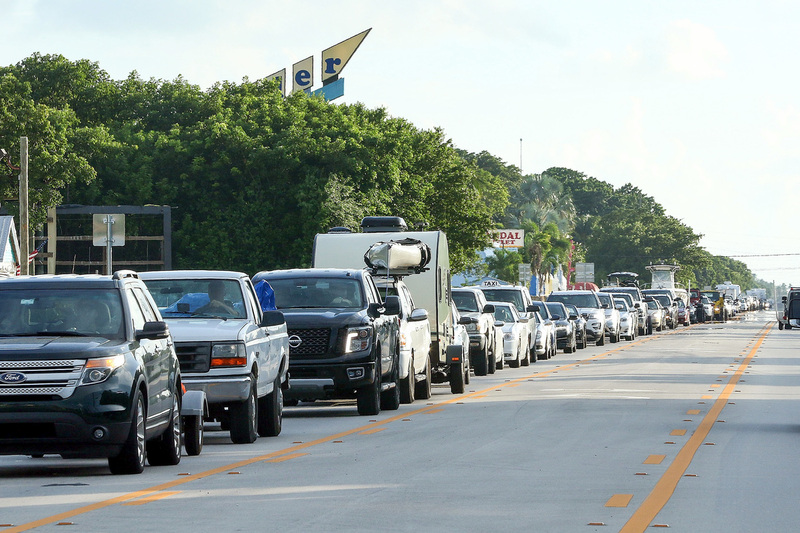 Traffic on Overseas Highway in Islamorada in the Florida Keys is backed up as people fleeing Hurricane Irma head north Tuesday. Visitors were told to leave on Wednesday, under mandatory evacuation orders that took effect at 7 a.m. ET. Irma, the strongest storm ever recorded in the Atlantic outside of the Caribbean and the Gulf of Mexico, is passing north of Puerto Rico Wednesday night, forecasters at the NHC say, and has devastated the island of Barbuda. The storm maintained its 185-mph winds after making its first landfall on Barbuda early Wednesday. Hurricane Irma, seen here in a 2 p.m. 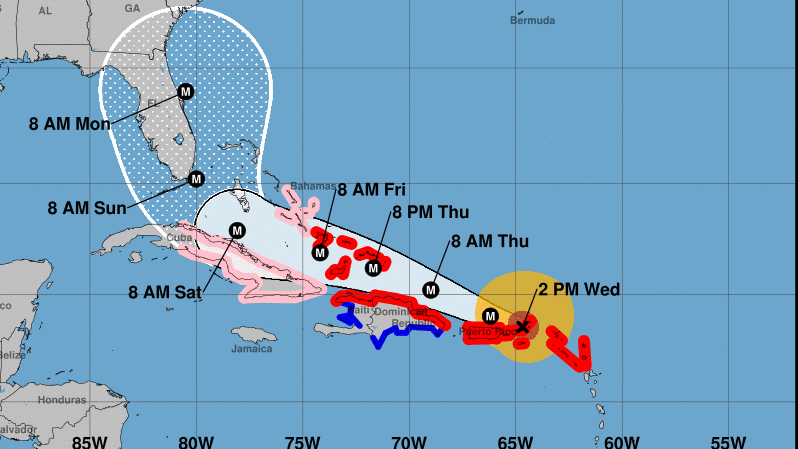 ET projection, is predicted to remain a major hurricane as it pushes its way through the Caribbean and arrives at Florida's coast this weekend. "Irma is a potentially catastrophic Category 5 hurricane and will bring life-threatening wind, storm surge and rainfall hazards" to areas it affects, the NHC says. The agency urges the completion of any emergency preparations and evacuations in the storm's path. Irma's path has been the subject of speculation, particularly as it nears the U.S. East Coast over the next three days. The NHC's forecasts now show the storm's path tracking up the eastern coast of Florida — rather than through the center or Gulf Coast, as in earlier projections. In Florida, where the hurricane could make landfall on Sunday, a mandatory evacuation order for the Florida Keys was expected to be issued Wednesday night, and Gov. Rick Scott warned that Irma "is bigger, faster and stronger than Hurricane Andrew," the 1992 storm that killed 65 people and caused more than $25 billion in damage. As the threat posed by the large, powerful storm was clarified this week, the governors of Puerto Rico and Florida had declared states of emergency. On Wednesday, South Carolina Gov. Henry McMaster also declared a state of emergency. North Carolina Gov. Roy Cooper said he would declare an emergency on Thursday morning. The Environmental Protection Agency said Wednesday night it is evaluating Superfund toxic waste sites in South Florida. The agency says it will alert local officials if effects of the hurricane will pose an immediate danger to people living nearby, and will order operators of the sites to take steps to secure hazardous materials. Rain from Irma began hitting parts of the U.S. Virgin Islands and Puerto Rico early Wednesday, the National Weather Service office in San Juan reports. The eye of the hurricane has passed over several islands Wednesday morning, slamming Barbuda and St. Martin. The prime minister of Antigua and Barbuda returned from a flight over Barbuda talking about "absolute devastation." Dramatic images emerged from St. Martin, with Radio Caraïbes International tweeting video of a ruined marina and water surging through the atrium of the beachfront Beach Plaza hotel. 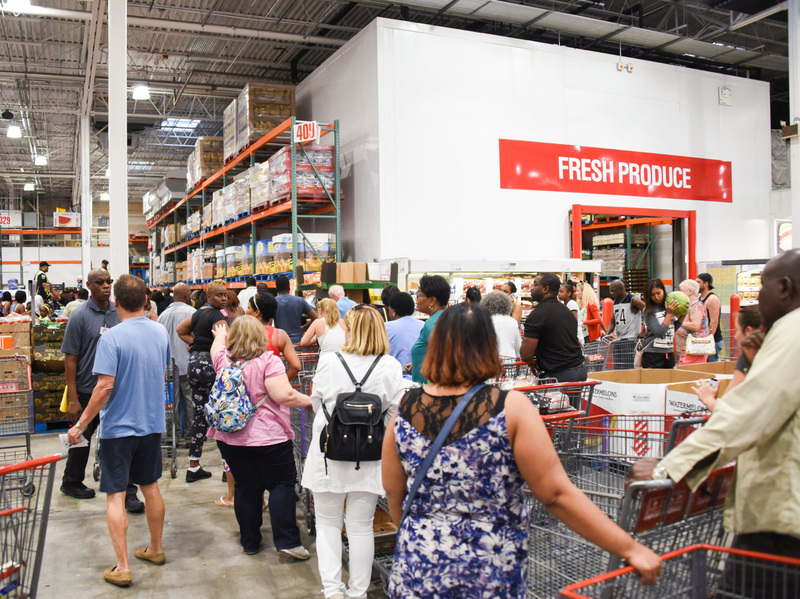 People wait in line at Costco for bottled water in preparation for Hurricane Irma on Tuesday in North Miami. The governors of both Puerto Rico and Florida declared states of emergency. A massive storm surge could bring perilous flooding and destructive waves, with a surge of 15 to 20 feet predicted for the Turks and Caicos and southeastern Bahamas. Northern Leeward Islands could see a surge of 7 to 11 feet, the hurricane center says. The chance that Irma will make a direct impact on Florida "continues to increase," the National Weather Service says, adding that it's too early to specify the timing and magnitude. In Key West, Fla., visitors were told to leave on Wednesday, under mandatory evacuation orders that took effect at 7 a.m. ET. For residents and business owners, the county's mandatory evacuation order takes effect at 7 p.m.
NPR's Hansi Lo Wang reports that Miami-Dade County Mayor Carlos Giménez is encouraging visitors to leave as soon as possible if they aren't planning to stay through the storm. 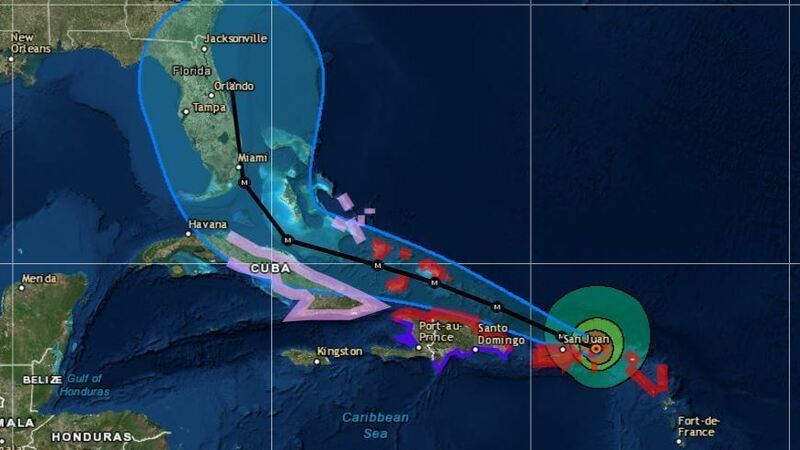 All public schools in the Miami-Dade County area are closed on Thursday and Friday. Scott has also activated 1,000 Florida National Guard members. With a tightly defined eye, high maximum winds and gusts of up to 195 knots — or 225 mph — Irma has left weather forecasters flabbergasted. "I am at a complete and utter loss for words looking at Irma's appearance on satellite imagery," NHC scientist Taylor Trogdon said Tuesday night, reacting to images of the storm's tight and powerful spiral. Irma is expected to remain a major hurricane for at least five days, including when it makes a predicted landfall on Florida and the U.S. mainland this weekend. According to some forecast models, Irma looks set to make landfall, then make an abrupt turn north, skirting the eastern coast of the state. But forecasters stress that the expected path could shift in the coming days. With maximum sustained winds of 185 mph, Irma is a Category 5 — the most serious type of major hurricane on the Saffir-Simpson wind scale. Describing the kind of destruction a Category 5 storm can cause, the National Hurricane Center says, "A high percentage of framed homes will be destroyed, with total roof failure and wall collapse." The agency adds, "Most of the area will be uninhabitable for weeks or months." Hurricane Jose, which was upgraded Wednesday after becoming a named storm the previous day, is trailing Irma's path in the Atlantic, moving toward the Caribbean. But Jose's track is predicted to veer north earlier than Irma's, glancing off the Leeward Islands and potentially sending it over the open sea. There are no watches or warnings currently associated with the storm. There also is a third named storm being tracked in the area, after Tropical Storm Katia formed inside the Gulf of Mexico. The storm off of the southern Mexican state of Veracruz has 40-mph winds.